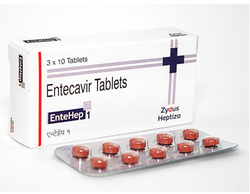 Pioneers in the industry, we offer entecavir tablet, entavir tablet, x vir entecavir tablet, ledifos, myhep lvir and ledviclear from India. Ledifos(Ledipasvir and Sofosbuvir) are the breakthrough treatments for Hepatitis C infections. Its mechanism of action involves inhibiting the enzyme which is necessary for the virus if it is to multiply. A complete cure may even be possible. Chronic hepatitis C is a serious infection of the liver which occurs following an infection with the hepatitis C virus. Upon reaching the cells of the liver, the virus begins to multiply, which it achieves by means of copying its DNA and RNA. This medicine is known as a nucleotide polymerase inhibitor, and it works directly on the virus itself. 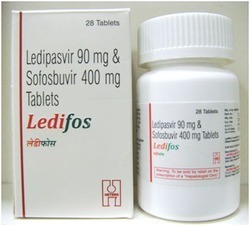 Ledifos(Ledipasvir and Sofosbuvir) each tablet contain Ledipasvir 90mg + Sofosbuvir 400mg. The dosage schedule must be individualized by the physician in charge of treatment and will vary according to the viral genotype that is being treated. Adult patients will usually be directed by their physician to take 1 tablet per day and it can be administered alongside a meal or else without food. Patients who are undergoing treatment for Hepatitis C with Ledifos(Ledipasvir and Sofosbuvir) will require regular visits to their physician or the hospital so that routine blood tests can be carried out. The frequency at which these tests are required will be determined by your physician. 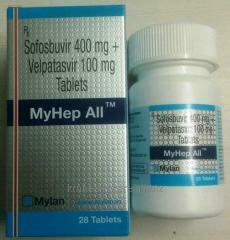 MyHep LVIR(Ledipasvir and Sofosbuvir) are the breakthrough treatments for Hepatitis C infections. Its mechanism of action involves inhibiting the enzyme which is necessary for the virus if it is to multiply. A complete cure may even be possible. Chronic hepatitis C is a serious infection of the liver which occurs following an infection with the hepatitis C virus. Upon reaching the cells of the liver, the virus begins to multiply, which it achieves by means of copying its DNA and RNA. This medicine is known as a nucleotide polymerase inhibitor, and it works directly on the virus itself. 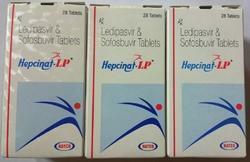 MyHep LVIR(Ledipasvir and Sofosbuvir) each tablet contain Ledipasvir 90mg + Sofosbuvir 400mg. The dosage schedule must be individualized by the physician in charge of treatment and will vary according to the viral genotype that is being treated. Adult patients will usually be directed by their physician to take 1 tablet per day and it can be administered alongside a meal or else without food. Patients who are undergoing treatment for Hepatitis C with MyHep LVIR(Ledipasvir and Sofosbuvir) will require regular visits to their physician or the hospital so that routine blood tests can be carried out. The frequency at which these tests are required will be determined by your physician. 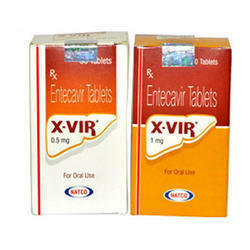 Ledviclear(Ledipasvir and Sofosbuvir) are the breakthrough treatments for Hepatitis C infections. Its mechanism of action involves inhibiting the enzyme which is necessary for the virus if it is to multiply. A complete cure may even be possible. Chronic hepatitis C is a serious infection of the liver which occurs following an infection with the hepatitis C virus. Upon reaching the cells of the liver, the virus begins to multiply, which it achieves by means of copying its DNA and RNA. This medicine is known as a nucleotide polymerase inhibitor, and it works directly on the virus itself. 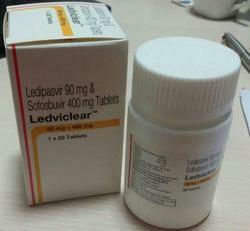 Ledviclear(Ledipasvir and Sofosbuvir) each tablet contain Ledipasvir 90mg + Sofosbuvir 400mg. The dosage schedule must be individualized by the physician in charge of treatment and will vary according to the viral genotype that is being treated. Adult patients will usually be directed by their physician to take 1 tablet per day and it can be administered alongside a meal or else without food. Patients who are undergoing treatment for Hepatitis C with Ledviclear(Ledipasvir and Sofosbuvir) will require regular visits to their physician or the hospital so that routine blood tests can be carried out. The frequency at which these tests are required will be determined by your physician. 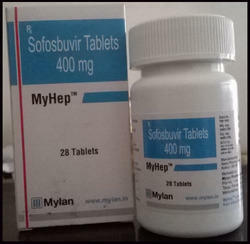 MyHep Contains Sofosbuvir 400mg which cures long-term hepatitis C virus (HCV) issues in specific people. It should be utilized alone or together with ribavirin. Sofosbuvir is actually some kind of HCV nucleotide analog polymerase substance. It minimizes the level of HCV in the human body through avoiding the spread of the HCV inside the human body. In most cases, you will take one tablet of MyHep each day for a period of 12 weeks. 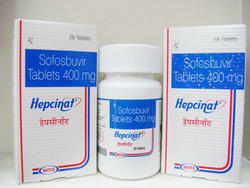 HepCvir Contains Sofosbuvir 400mg which cures long-term hepatitis C virus (HCV) issues in specific people. It should be utilized alone or together with ribavirin. Sofosbuvir is actually some kind of HCV nucleotide analog polymerase substance. It minimizes the level of HCV in the human body through avoiding the spread of the HCV inside the human body. In most cases, you will take one tablet of HepCvir each day for a period of 12 weeks. 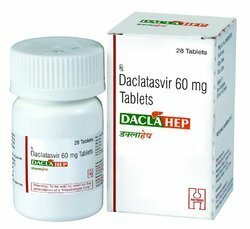 Daclatasvir is indicated in combination other medicinal products for the treatment of chronic hepatitis C virus (HCV) infection in adults. 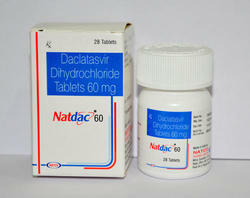 Natdac (Daclatasvir Dihydrochloride) is a treatment for chronic hepatitis C virus (HCV) genotype 1 or genotype 3 infection. It is prescribed with sofosbuvir, and with or without ribavirin. The recommended dosage in most people is one 60mg tablet taken each day. The tablet is taken orally and should be swallowed whole with a glass of water. It can be taken with or without food. Treatment with Natdac (Daclatasvir Dihydrochloride) is usually prescribed for a period of 12 weeks. Natdac should always be taken concurrently with Sofosbuvir. The most common side effects associated with Natdac (Daclatasvir Dihydrochloride) and Sofosbuvir treatment are headache, fatigue, nausea and diarrhea. When Natdac is taken with Sofosbuvir and Ribavirin people also report anemia, rash, insomnia, dizziness and somnolence as side effects. Amiodarone when used with Natdac and Sofosbuvir has caused in serious symptomatic bradycardia in some patients. The risk of bradycardia is increased in patients who are taking beta-blockers or patients with heart problems or liver disease. Daclahep (Daclatasvir Dihydrochloride) is a treatment for chronic hepatitis C virus (HCV) genotype 1 or genotype 3 infection. It is prescribed with sofosbuvir, and with or without ribavirin. Treatment with Daclahep (Daclatasvir Dihydrochloride) is usually prescribed for a period of 12 weeks. Daclahep should always be taken concurrently with Sofosbuvir. The most common side effects associated with Daclahep (Daclatasvir Dihydrochloride) and Sofosbuvir treatment are headache, fatigue, nausea and diarrhea. When Daclahep is taken with Sofosbuvir and Ribavirin people also report anemia, rash, insomnia, dizziness and somnolence as side effects. Amiodarone when used with Daclahep and Sofosbuvir has caused in serious symptomatic bradycardia in some patients. The risk of bradycardia is increased in patients who are taking beta-blockers or patients with heart problems or liver disease. We are the reliable organization engaged in offering high quality and well-tested Sofosbuvir 400mg + Ledipasvir 90mg tablets. 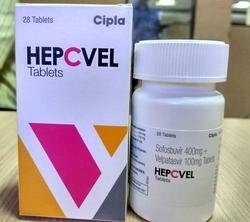 Ledipasvir and Sofosbuvir are the breakthrough treatments for Hepatitis C infections. Its mechanism of action involves inhibiting the enzyme which is necessary for the virus if it is to multiply. A complete cure may even be possible. Chronic hepatitis C is a serious infection of the liver which occurs following an infection with the hepatitis C virus. Upon reaching the cells of the liver, the virus begins to multiply, which it achieves by means of copying its DNA and RNA. This medicine is known as a nucleotide polymerase inhibitor, and it works directly on the virus itself. Ledifos tablets is processed using quality approved chemical compounds with latest techniques to ensure maximum effectiveness. It is highly demanded in medical industry and is widely used in the treatment of Hepatitic C Virus (HCV) Infection. Our offered medicine is freely soluble in liquid. Furthermore, the offered can be availed in diverse packaging options at economical prices. Ledipasvir combination with Sofosbuvir is indicated for the treatment of patients with chronic hepatitis C virus (HCV) genotype 1, 4, 5 or 6 infection, Fixed-dose combination tablet containing ledipasvir and sofosbuvir for oral administration. Ledipasvir is an HCV NS5A inhibitor and sofosbuvir is a nucleotide analog inhibitor of HCV NS5B polymerase. Sofocure Contains Sofosbuvir 400mg which cures long-term hepatitis C virus (HCV) issues in specific people. It should be utilized alone or together with ribavirin. Sofosbuvir is actually some kind of HCV nucleotide analog polymerase substance. It minimizes the level of HCV in the human body through avoiding the spread of the HCV inside the human body. In most cases, you will take one tablet of Sofocure each day for a period of 12 weeks. Velpatasvir and Sofosbuvir is a pan-genotopic treatment for Chronic Hepatitis C (HCV), meaning it can be used to treat chronic HCV genotype 1, 2, 3, 4, 5, or 6 infection. It is a fixed-dose combination of sofosbuvir (a hepatitis C virus (HCV) nucleotide analog NS5B polymerase inhibitor) and Velpatasvir (an HCV NS5A inhibitor). 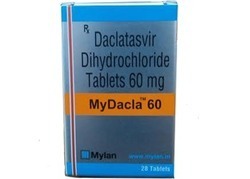 Mydacla (Daclatasvir Dihydrochloride) is a treatment for chronic hepatitis C virus (HCV) genotype 1 or genotype 3 infection. It is prescribed with sofosbuvir, and with or without ribavirin. Treatment with Mydacla (Daclatasvir Dihydrochloride) is usually prescribed for a period of 12 weeks. Mydacla should always be taken concurrently with Sofosbuvir. The most common side effects associated with Mydacla (Daclatasvir Dihydrochloride) and Sofosbuvir treatment are headache, fatigue, nausea and diarrhea. When Mydacla is taken with Sofosbuvir and Ribavirin people also report anemia, rash, insomnia, dizziness and somnolence as side effects. Amiodarone when used with Mydacla and Sofosbuvir has caused in serious symptomatic bradycardia in some patients. The risk of bradycardia is increased in patients who are taking beta-blockers or patients with heart problems or liver disease. 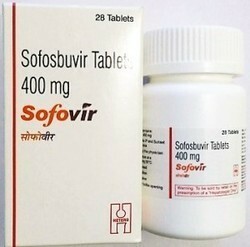 Sofovir Contains Sofosbuvir 400mg which cures long-term hepatitis C virus (HCV) issues in specific people. It should be utilized alone or together with ribavirin. Sofosbuvir is actually some kind of HCV nucleotide analog polymerase substance. It minimizes the level of HCV in the human body through avoiding the spread of the HCV inside the human body. 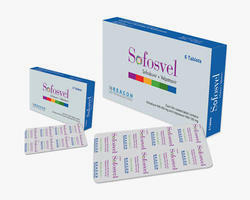 In most cases, you will take one tablet of Sofovir each day for a period of 12 weeks. 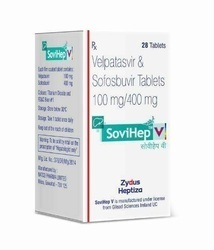 Velpanat by Natco pharma is a two-drugs Velpatasvir 100mg Sofosbuvir 400mg combination for the treatment of hepatitis C. It is administered as a single daily pill containing the viral NS5A inhibitor velpatasvir and sofosbuvir, a nucleotide inhibitor of the viral RNA polymerase. Resof L(Ledipasvir and Sofosbuvir) are the breakthrough treatments for Hepatitis C infections. Its mechanism of action involves inhibiting the enzyme which is necessary for the virus if it is to multiply. A complete cure may even be possible. Chronic hepatitis C is a serious infection of the liver which occurs following an infection with the hepatitis C virus. Upon reaching the cells of the liver, the virus begins to multiply, which it achieves by means of copying its DNA and RNA. This medicine is known as a nucleotide polymerase inhibitor, and it works directly on the virus itself. 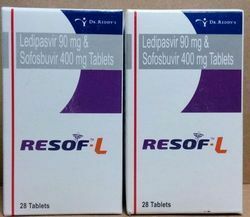 Resof L(Ledipasvir and Sofosbuvir) each tablet contain Ledipasvir 90mg + Sofosbuvir 400mg. The dosage schedule must be individualized by the physician in charge of treatment and will vary according to the viral genotype that is being treated. Adult patients will usually be directed by their physician to take 1 tablet per day and it can be administered alongside a meal or else without food. Patients who are undergoing treatment for Hepatitis C with Resof L(Ledipasvir and Sofosbuvir) will require regular visits to their physician or the hospital so that routine blood tests can be carried out. The frequency at which these tests are required will be determined by your physician. 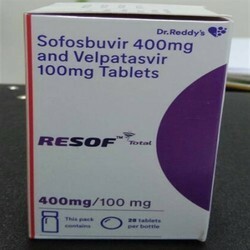 Resof Contains Sofosbuvir 400mg which cures long-term hepatitis C virus (HCV) issues in specific people. It should be utilized alone or together with ribavirin. Sofosbuvir is actually some kind of HCV nucleotide analog polymerase substance. It minimizes the level of HCV in the human body through avoiding the spread of the HCV inside the human body. In most cases, you will take one tablet of Resof each day for a period of 12 weeks. Sofocure L(Ledipasvir and Sofosbuvir) are the breakthrough treatments for Hepatitis C infections. Its mechanism of action involves inhibiting the enzyme which is necessary for the virus if it is to multiply. A complete cure may even be possible. Chronic hepatitis C is a serious infection of the liver which occurs following an infection with the hepatitis C virus. Upon reaching the cells of the liver, the virus begins to multiply, which it achieves by means of copying its DNA and RNA. This medicine is known as a nucleotide polymerase inhibitor, and it works directly on the virus itself. Sofocure L(Ledipasvir and Sofosbuvir) each tablet contain Ledipasvir 90mg + Sofosbuvir 400mg. The dosage schedule must be individualized by the physician in charge of treatment and will vary according to the viral genotype that is being treated. Adult patients will usually be directed by their physician to take 1 tablet per day and it can be administered alongside a meal or else without food. Patients who are undergoing treatment for Hepatitis C with Sofocure L(Ledipasvir and Sofosbuvir) will require regular visits to their physician or the hospital so that routine blood tests can be carried out. The frequency at which these tests are required will be determined by your physician. Virpas (Ledipasvir and Sofosbuvir) are the breakthrough treatments for Hepatitis C infections. Its mechanism of action involves inhibiting the enzyme which is necessary for the virus if it is to multiply. A complete cure may even be possible. Chronic hepatitis C is a serious infection of the liver which occurs following an infection with the hepatitis C virus. Upon reaching the cells of the liver, the virus begins to multiply, which it achieves by means of copying its DNA and RNA. This medicine is known as a nucleotide polymerase inhibitor, and it works directly on the virus itself. 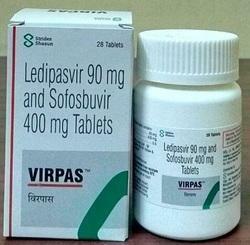 Virpas(Ledipasvir and Sofosbuvir) each tablet contain Ledipasvir 90mg + Sofosbuvir 400mg. The dosage schedule must be individualized by the physician in charge of treatment and will vary according to the viral genotype that is being treated. Adult patients will usually be directed by their physician to take 1 tablet per day and it can be administered alongside a meal or else without food. Patients who are undergoing treatment for Hepatitis C with Virpas(Ledipasvir and Sofosbuvir) will require regular visits to their physician or the hospital so that routine blood tests can be carried out. The frequency at which these tests are required will be determined by your physician. 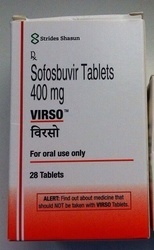 Virso Contains Sofosbuvir 400mg which cures long-term hepatitis C virus (HCV) issues in specific people. It should be utilized alone or together with ribavirin. Sofosbuvir is actually some kind of HCV nucleotide analog polymerase substance. It minimizes the level of HCV in the human body through avoiding the spread of the HCV inside the human body. In most cases, you will take one tablet of Virso each day for a period of 12 weeks. Sofosvel is the global first generic oral tablet for pan-genotypic Chronic Hepatitis C treatment. The combination of (Sofosbuvir 400 mg + Valpatasvir 100 mg) drug has been approved by US FDA European Commission for treatment of patients with all genotypic Chronic Hepatitis C virus infection. Sofosvel is used without cirrhosis or with compensated cirrhosis and patients with advanced cirrhosis (Decompensated). Sofosvel Each tablet contains 400mg of Sofosbuir and 100mg of Velpatasvir. In most cases, you will take one tablet of Sofosvel each day for a period of 12 weeks. This dosage may need to be adjusted in patients with renal impairment or renal disease. Sofosvel is taken alone in cases without cirrhosis or with compensated cirrhosis (Child-Pugh A). Sofosvel is used in combination with ribavirin in cases with decompensated cirrhosis (Child-Pugh B and C). The most common side effects of Sofosvel are headache and tiredness. If taken in combination with ribavirin other common side effects are anemia, nausea, insomnia, and diarrhea. When Sofosvel is used in combination with medicines containing amiodarone it can lead to serious side effects including slowing of the heart rate. This can result in death or need of a pacemaker. If you are taking these medicines in combination, tell your doctor immediately if you notice fainting or near-fainting, dizziness or lightheadedness, not feeling well, weakness, extreme tiredness, shortness of breath, chest pains, confusion, or memory problems. Prior to taking Sofosvel, make sure you tell your doctor of any medical conditions you have (especially any other liver problems or kidney problems). Tell your doctor if you are pregnant or trying to become pregnant, or if you are breastfeeding or planning to breastfeed. Sofosvel can can unwanted interactions with some other medicines. Make sure to tell your doctor of all medicines you are taking including prescription and over-the-counter medicines, vitamins, and herbal supplements. Or particular importance are any products containing tenofovir disoproxil fumarate or amiodarone. Velpanat is a pan-genotopic treatment for Chronic Hepatitis C (HCV), meaning it can be used to treat chronic HCV genotype 1, 2, 3, 4, 5, or 6 infection. It is a fixed-dose combination of sofosbuvir (a hepatitis C virus (HCV) nucleotide analog NS5B polymerase inhibitor) and Velpatasvir (an HCV NS5A inhibitor). 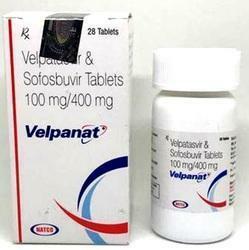 Velpanat Each tablet contains 400mg of Sofosbuir and 100mg of Velpatasvir. In most cases, you will take one tablet of Velpanat each day for a period of 12 weeks. This dosage may need to be adjusted in patients with renal impairment or renal disease. Velpanat is taken alone in cases without cirrhosis or with compensated cirrhosis (Child-Pugh A). Velpanat is used in combination with ribavirin in cases with decompensated cirrhosis (Child-Pugh B and C). The most common side effects of Velpanat are headache and tiredness. If taken in combination with ribavirin other common side effects are anemia, nausea, insomnia, and diarrhea. When Velpanat is used in combination with medicines containing amiodarone it can lead to serious side effects including slowing of the heart rate. This can result in death or need of a pacemaker. If you are taking these medicines in combination, tell your doctor immediately if you notice fainting or near-fainting, dizziness or lightheadedness, not feeling well, weakness, extreme tiredness, shortness of breath, chest pains, confusion, or memory problems. Prior to taking Velpanat, make sure you tell your doctor of any medical conditions you have (especially any other liver problems or kidney problems). Tell your doctor if you are pregnant or trying to become pregnant, or if you are breastfeeding or planning to breastfeed. Velpanat can can unwanted interactions with some other medicines. Make sure to tell your doctor of all medicines you are taking including prescription and over-the-counter medicines, vitamins, and herbal supplements. Or particular importance are any products containing tenofovir disoproxil fumarate or amiodarone. 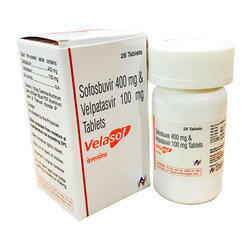 Velasof by Hetero Healthcare is a combination of two-drugs as Velpatasvir 100mg and Sofosbuvir 400mg for the treatment of hepatitis C. It is administered as a single daily pill containing the viral NS5A inhibitor velpatasvir and sofosbuvir, a nucleotide inhibitor of the viral RNA polymerase. Hepatitis C virus (HCV) causes both acute and chronic infection. Acute HCV infection is usually asymptomatic and is only very rarely (if ever) associated with life-threatening disease. About 15–45% of infected persons spontaneously clear the virus within 6 months of infection without any treatment. We have Hepatitis C treatment medicines like Sofosbuvir, Ledipasvir, Ribavirin, Velpatasvir and its combination available with us. Velasof is a pan-genotopic treatment for Chronic Hepatitis C (HCV), meaning it can be used to treat chronic HCV genotype 1, 2, 3, 4, 5, or 6 infection. It is a fixed-dose combination of sofosbuvir (a hepatitis C virus (HCV) nucleotide analog NS5B polymerase inhibitor) and Velpatasvir (an HCV NS5A inhibitor). 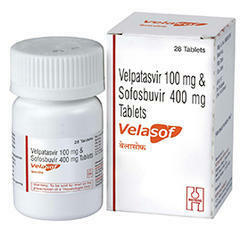 Velasof Each tablet contains 400mg of Sofosbuir and 100mg of Velpatasvir. In most cases, you will take one tablet of Velasof each day for a period of 12 weeks. This dosage may need to be adjusted in patients with renal impairment or renal disease. Velasof is taken alone in cases without cirrhosis or with compensated cirrhosis (Child-Pugh A). Velasof is used in combination with ribavirin in cases with decompensated cirrhosis (Child-Pugh B and C). The most common side effects of Velasof are headache and tiredness. 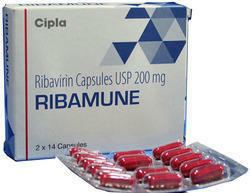 If taken in combination with ribavirin other common side effects are anemia, nausea, insomnia, and diarrhea. When Velasof is used in combination with medicines containing amiodarone it can lead to serious side effects including slowing of the heart rate. This can result in death or need of a pacemaker. If you are taking these medicines in combination, tell your doctor immediately if you notice fainting or near-fainting, dizziness or lightheadedness, not feeling well, weakness, extreme tiredness, shortness of breath, chest pains, confusion, or memory problems. Prior to taking Velasof, make sure you tell your doctor of any medical conditions you have (especially any other liver problems or kidney problems). Tell your doctor if you are pregnant or trying to become pregnant, or if you are breastfeeding or planning to breastfeed. Velasof can can unwanted interactions with some other medicines. Make sure to tell your doctor of all medicines you are taking including prescription and over-the-counter medicines, vitamins, and herbal supplements. Or particular importance are any products containing tenofovir disoproxil fumarate or amiodarone. Looking for Hepatitis Medicines ?